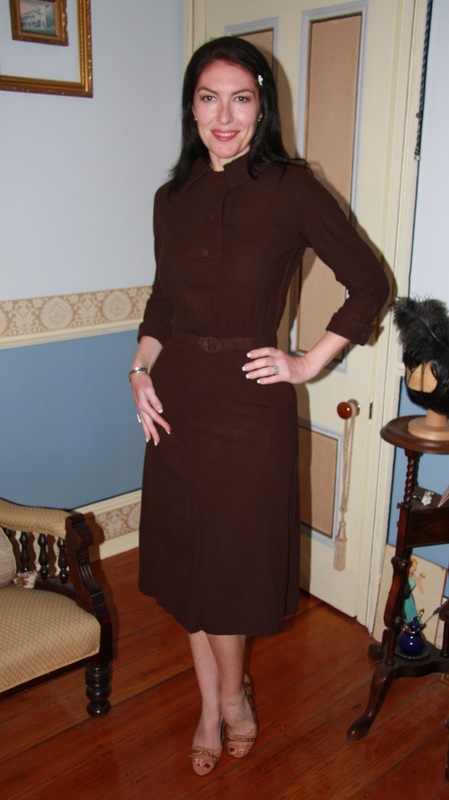 Outfit: Vintage (1950s) chocolate brown woollen dress with bracelet length sleeves and inverted pleat to skirt. Shoes: Tan heels with chocolate trim and fringing. Hair: Worn loose and straight with a vintage diamante hair pin. Accessories: Sterling silver and cats eye stud earrings, sterling silver cuff bracelet. I’m so sorry to bother you and I apologize for once again deleting and changing my blog name. I seem to be having trouble with internet services. Everything seems back to normal at present, so I wanted to tell you that this is my favorite outfit thus far! I truly love your shoes, very classy and alluring at the same time. Thanks for indulging me once again. . . Thank you for taking the time to blog also, I know the commitment and I appreciate your steadfastness.